The origin of Johnstone can be traced precisely to the 23rd February 1782, when George Houstoun, the Laird of the Lands of Johnstone, sold the first tracts of land feus from his estate. Using the power from the River Black Cart the town's cotton and flax spinning industry rapidly expanded until over 20 mills were in operation. The cotton mills gave rise to a need for engineering skills to maintain the water wheel machinery and the spinning machines. These were boom times for the spinning industry in Johnstone. But this was not going to last. As a result of the cotton famine caused by the American Civil War and the advent of steam power, by 1850, cotton spinning began to decline. But as the mills closed all was not lost for the people of Johnstone. The engineering businesses, built on cotton, survived the decline, and they then prospered in their own right. New firms were created that manufactured machine-tools of all kinds (see the photographs in our Gallery). Foundries were built to support the engineering works and there was a demand for the heavy machine tools for the construction of the iron ships being built on the Clyde. By the 1900s Johnstone designed and built machines were in demand all over the world. This was the second Industrial Revolution for the town of Johnstone. The Museum exhibits trace the History of the Town from its inception though the rise and fall of the Textile industry and on to the various Engineering business. Some Engineering businesses survive in the Town to this day. Come renew your acquaintance! See our spiffy new paint job and review our new and reorganized exhibits. Forthcoming exhibit of models by John Butler are a great reason to hie thee down to the Museum soon. We've added a Donate button to the home page. Your gift helps support this site and the museum. Join to post your own updates and comments. 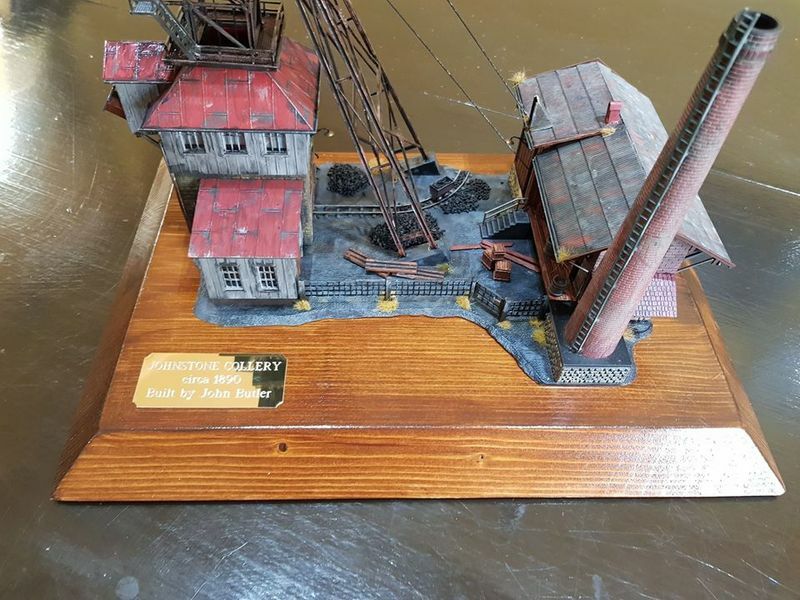 Thanks to John Butler, who built our Model Coal Mine, we now have a brand new exhibition of many of his fantastically detailed models which have won him many awards in National Model Competitions. Our 2019 Johnstone Calendar is now on Sale in our Shop section. A4 size with 12 photographs of Johnstone Past & Present. Sent to you anywhere in the World. Thanks to John Butler, we now have our own Johnstone Coal Mine model. It now takes pride of place in one of our display cabinets. Thanks to the efforts of Rees Clark, our brilliant Web sponsor, we can now post little videos on our site. Our first adventure is to show you the newly painted Museum and new displays. More to come once we find our feet. Other Johnstone history friends have also created a Facebook page with running commentaries and personal stories.